Charming, romantic, ancient, beautiful are just a few of the adjectives used when describing Mala Strana, the oldest quarter in Prague. The cobbled streets in this part of town are smaller and narrower than elsewhere in the city. 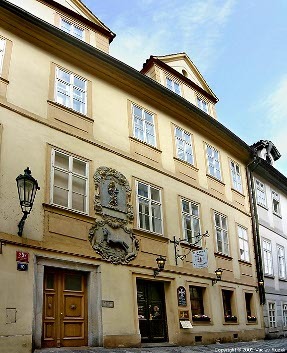 They retain the charm and atmosphere of a city from the 16th, 17th or 18th century. Horses and handsome cabs can still be seen, intermingled among trams and cars. There is no finer quarter for beautiful buildings, wonderful restaurants and access to the main tourist attractions. 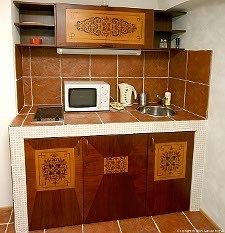 This apartment feature free WiFi internet access! 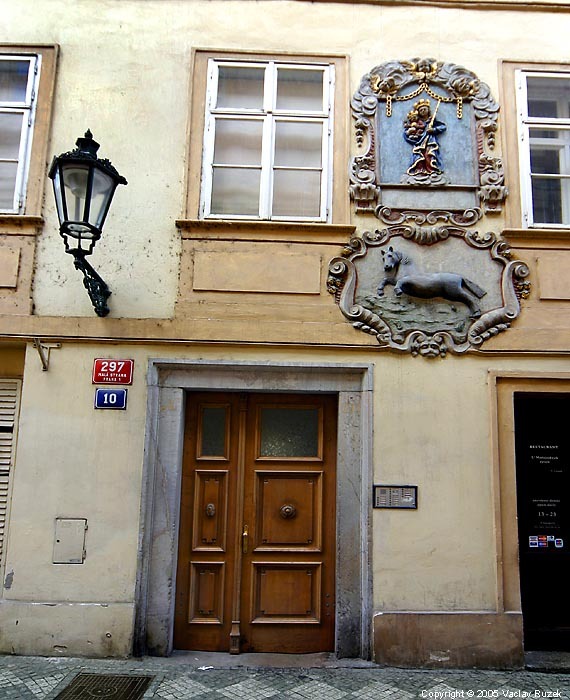 Prokopska 10 is a lovely 16th century building just off of Karmelitska street, around the corner from Malostranske namesti (Lesser Town Square) and just 7 minutes on foot from the Charles Bridge. The thick wooden door under the painted unicorn leads into a spacious, quiet courtyard, the heavy walls shutting out all of the noise from the surrounding streets. Ivy creeps up the far wall. There is even a table and bench if you wish to while away a summer evening sipping a glass of fine Czech white wine or an imported red. 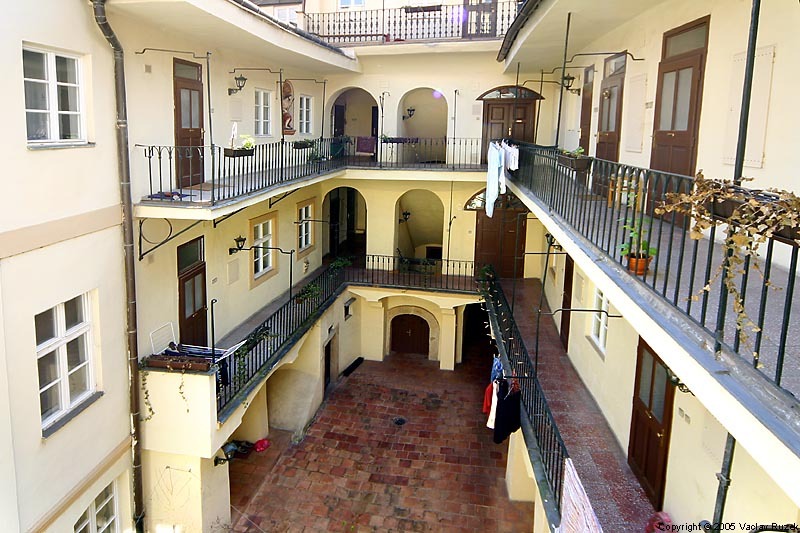 The stairway is wide and carpeted and leads to interior balconies which rim the courtyard. 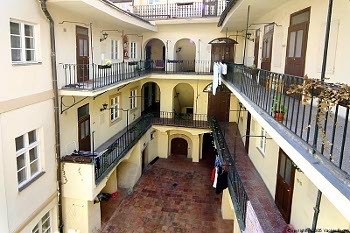 Our flat, on the second floor, looks out into the courtyard. 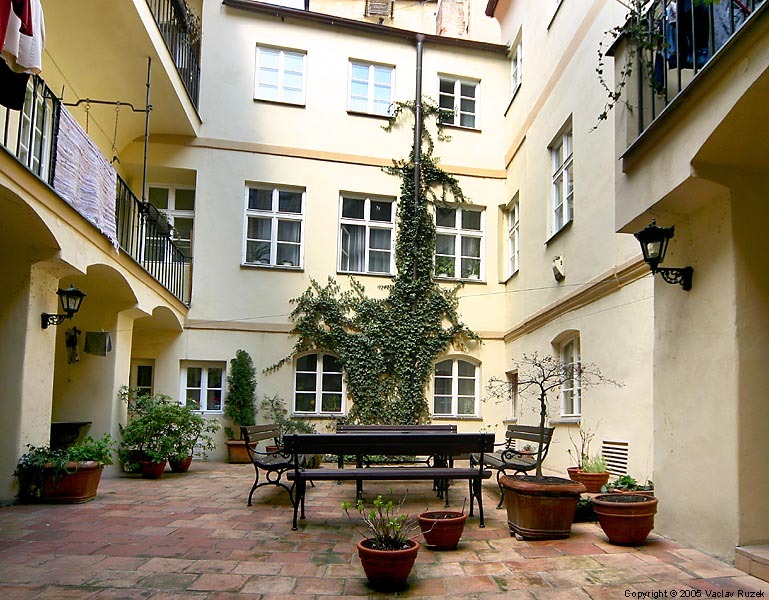 A more romantic space would be hard to imagine, especially in the heart of Prague. Through the double doors you enter a small hallway. 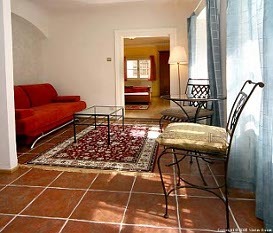 Walking straight ahead takes you into the living room and kitchen corner. There's a small glass table and two chairs for dining on. 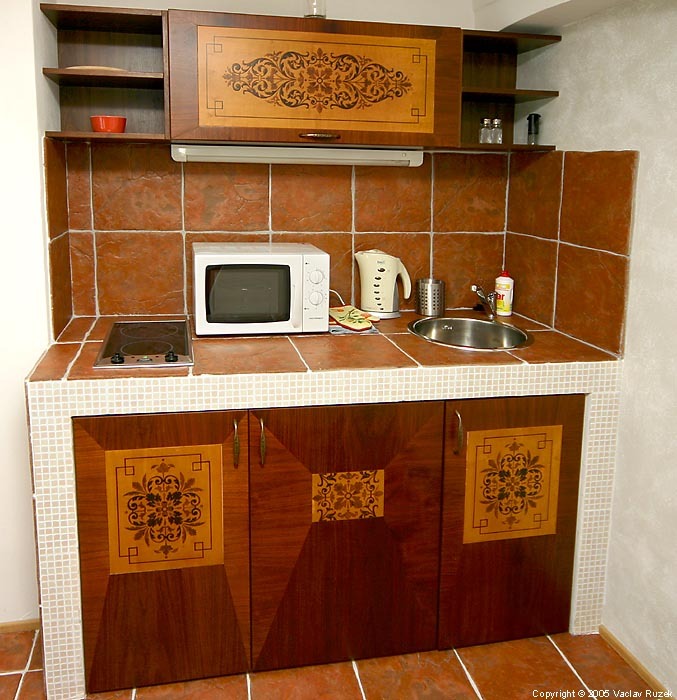 As in all our flats you'll find a full set of pots and pans, dishes, silverware, a 'fridge, a microwave, and stove top burners so if you want to cook in you can! A luxurious double bed awaits in the bedroom, and the window looks away from the courtyard so late sleepers won't be bothered by noise! 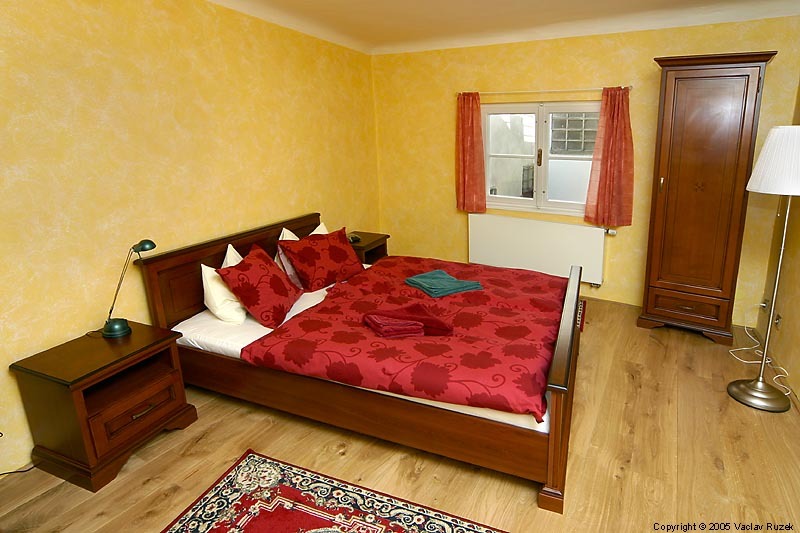 There is also a stereo and to get to sleep with and an alarm clock to wake up by. If another person or couple wants to share the flat, the couch in the living room pulls out into a second double bed. But please note that its not really comfortable for two adult persons. Off the entrance hallway is the bathroom which has just been newly refitted. 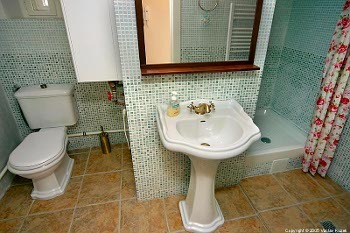 There is a gas water heater, toilet and shower along with a beautiful mirror. After a hard day of sight seeing, you can come back to Prokopska and relax. 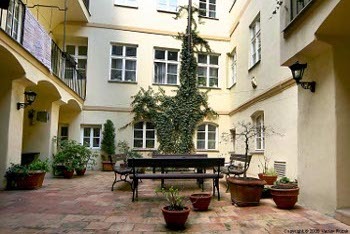 Take a shower, open a bottle of wine, sit in the courtyard and soak up Prague's atmosphere. 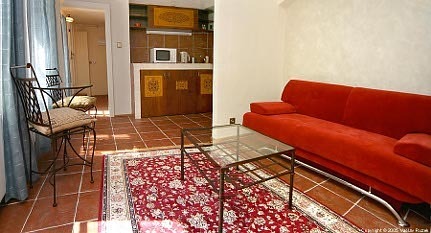 Minimal lenght of stay 2 nights during the week and 3 nights on a weekend.